Day in and day out, external influences like UV, pollution and stress can speed up the skin's natural aging process, resulting in a greater than normal loss of collagen & elastic fibers. Pond's Age Miracle Wrinkle Corrector Day Cream SPF 18 PA++ is an anti-wrinkle day cream made with Pond's most advanced technology - Retinol-C Complex, that penetrates the skin continuously to release powerful anti-aging retinoid actives for 24hr non-stop. It can help reduce the appearance of fine lines, wrinkles and crow's feet from the inside, leaving skin that feels softer, more moisturized and youthfully radiant on the outside. With added UVA/UVB sunscreens, this moisturizer with SPF and PA also provides protection against UV rays. With added Vitamin B3, it also helps strengthen the skin's protective barrier and keep your skin looking fair and radiant. In addition, it also contains Vitamin E acetate that uses its anti-oxidant power to protect skin cells from foreign threats. Use this anti-aging moisturizer for youthfully radiant skin. Simply apply every day after cleansing for skin that's moisturized and smooth. Uses Pond's most advanced anti-aging technology, Retinol-C Complex, to continuously release powerful anti-aging retinoid actives for 24hr non-stop, to reduce the appearance of wrinkles & boost radiance from the inside. A powerful anti-aging fairness cream that also contains Vitamin B3 to strengthen skin's natural barrier and protect against blemishes, & Vitamin E acetate with anti-oxidant power to protect skin cells from foreign threats. An anti-wrinkle cream that is easy to use: apply to skin after cleansing to experience the benefits of youthful looking skin. Explore the entire range of Face Moisturizer & Day Cream available on Nykaa. 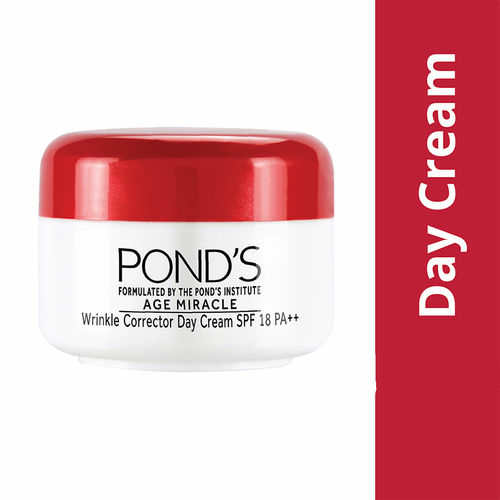 Shop more Ponds products here.You can browse through the complete world of Ponds Face Moisturizer & Day Cream .Alternatively, you can also find many more products from the Ponds Age Miracle Wrinkle Corrector Day Cream SPF 18 PA++ range.